The Texas Rangers announced before Sunday's game that they will go with the ever-growing opener pitching strategy when they begin a three-game series with the Los Angeles Angels on Monday at Globe Life Park in Arlington, Texas. But the way the Rangers hit the ball on Sunday in a 18-4 win over Minnesota, it might not matter who pitches. Texas, winners of two straight games after losing five in a row, will send left-handed reliever Jeffrey Springs to the mound to begin Monday's game. Springs (0-0, 2.55 ERA) will be followed by Ariel Jurado for Texas, who is normally a starter. The Angels will counter with right-hander Matt Shoemaker (1-0, 4.76) in the series opener. "It's something we thought about," Texas manager Jeff Banister told MLB.com. "We have a little better feel for the personnel. We still feel good about Jurado, but we'd also still like to take a look at this process. If it gives Jeffrey Springs the feel for starting a baseball game." Texas ripped off a nine-run sixth inning that included three home runs, all part of a club-record 13 extra-base hits in the victory. The series win was the first for the Rangers since taking three of four games from the Angels on Aug. 16-19. The Angels head to the Dallas-Fort Worth Metroplex after a 4-2 loss to Houston on Sunday, losing the final two of four games this week to the AL West-leading Astros. 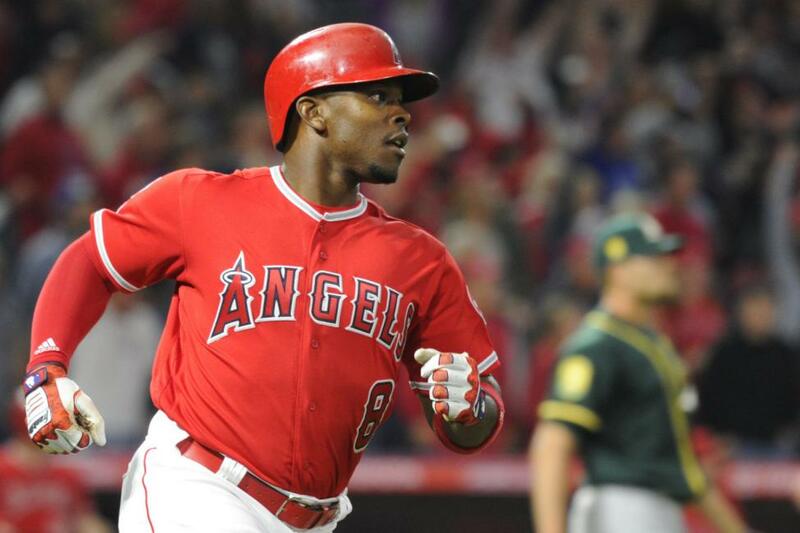 Left fielder Justin Upton was out of the Angels' starting lineup against the Astros on Sunday after sustaining a concussion during Saturday's 7-3 loss at Minute Maid Park. "I feel all right," Upton said. "[Trainer] Adam [Nevala] said it's going to be a day-to-day thing. That's the plan, just to get better every day." Upton is batting .265 with a .816 OPS, 26 home runs, and 75 RBIs in 125 games this season. Eric Young Jr. started in left field in place of Upton on Sunday. Upton won't be cleared to return until his symptoms subside. "It's not that severe for me," Upton said. "But there are serious concussions, and it's not something you kind of play around with or mess around with." Shoemaker is scheduled to return from the disabled list to make his second start of the season and first since March 31 at Oakland. In the interim, he will have missed 134 games with a right forearm strain. Shoemaker made a rehab appearance with Class A Inland Empire on Wednesday against Lake Elsinore, throwing four hitless innings while striking out a half-dozen. "Without putting too much pressure on a guy, hopefully, he'll get into his game and pitch like Matty can pitch," Angels manager Mike Scioscia said about Shoemaker. "We'll take it inning by inning, see how he holds up. But his stuff graded out very well in his minor league appearance." In six career starts against the Rangers, he is 4-2 with a 5.68 ERA. Shoemaker picked up wins in each of his first four starts against Texas but has lost the past two. Springs has spun five shutout innings in his past three games. He made his major league debut on July 31 at Arizona, striking out three of the final four batters he faced, after having his contract purchased from Triple-A Round Rock before the game. Jurado will see the bulk of the pitching action for the Rangers as each of his first seven big-league games has been as a starter. He last pitched and took the loss in the first game of this homestand, an 8-4 loss on Tuesday to the Los Angeles Dodgers.